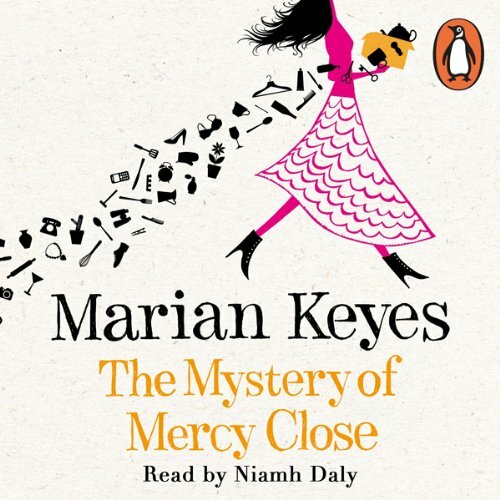 The unabridged, downloadable audiobook edition of Marian Keye’s heartbreaking stunner of a novel, The Mystery of Mercy Close, read by the actress Niamh Daly. Meet Helen - youngest of the Walsh sisters and a law unto herself. She’s easily bored, has an inability to filter her thoughts and was fired from every job she ever had before she found her true calling as a private investigator. But times are tough for PIs, and Helen’s had no choice but to take on the search for AWOL boyband has-been Wayne Diffney: The Wacky One. It’s not all bad this game of Where’s Wayne. It may have brought her charming crook of an ex Jay Parker back into her life, but it’s giving her an excuse to avoid the usual Walsh family dramas and the intense looks from her gorgeous boyfriend Artie that make her heart beat wildly with lust and panic in equal measure. But most of all it’s an excellent distraction from the huge swarm of black vultures gathering over her head. If she hides out in her target’s empty house on Mercy Close for long enough maybe they’ll go away...But as Helen begins to unravel the mysteries secreted on Mercy Close she discovers a kindred spirit in a man unwilling to be found. Could someone be telling her to look a little closer to home? I know Marian has suffered major depression, I have too ... I empathise. But your fans have a certain level of fun, excitement + a smidge of naughty/dodgy behaviour of your characters to keep your fans amused. But for the author to use the key protaganist, Helen, one of the Walsh sisters to go through severe depression and what she did, experienced etc. I felt Marian Keyes was using this character as a cathartic to go through her own experiences and issues. Fair enough for her. But not for her readers/listeners .. we want to be enterained and pay to read/listen, and not feel we're sharing the same kind of mental overhaul she went through, and then she got paid tons of bucks to write this book. If she wasnt a bestselling author, and sent this book to every publisher in the world, it wouldnt have been published by anyone. Sorry, Marian, but its true, and deepdown you know this. You cant's turn out this kind of pap, when your fans have devoured your last 8 books with glee. Which character – as performed by Niamh Daly – was your favorite? the key character - Helen, Niamh was exciting and kept me listening, through a very predictable plod of a tale. It's not the narrater's fault that she had a bad read to narrate. Without her, I would've let it go and just skipped to the end within the 1st hour. Could you see The Mystery of Mercy Close being made into a movie or a TV series? Who should the stars be? I know Marian has suffered major depression, I empathise. But your fans have a certain level of fun, excitement + a smidge of naughty/dodgy behaviour of your characters to keep your fans amused. I literally laughed out loud. Wonderfully entertaining, I enjoyed every minute of it. There couldn’t have been a more perfect choice of narrator for this book. Niamh Daly did a remarkable job. The mystery part is good, you won't be able to decipher until almost the end, just a little bit ahead of the protagonist and then revising the clues said "of course!" but that is the fun, right ? So, to me the achievement of this listen is that going thru this little mystery the listener learns the suffering of a person with e. depression and by knowing and understanding this terrible disease one becomes more respectful and compassionate towards these patients, at least that is what I believe. Also I should point out that it is a shock this dark version of M.Keyes. there is this black humor and kind of bitter wit towards the world as it is now (mostly the economy). But again it is the color of the glass through which the protagonist watches said world. The performer is great.Very, very good ! Really enjoyed this audio book. Marian Keyes toes the line between funny and dark so well, and this book keeps you interested all the way through. Very heartwarming ending and the narrator's interpretation is great too, especially for mammy Walsh! I am not a big fan of Helen Walsh but I had to respect the lady. She had her quirks for sure but managed to get the job done. I was particularly impressed with Marian Keyes' descriptions of depression and what it feels like to be in the throes of an illness that you can't seem to get a handle on. The inability to escape your own brain, is truly terrifying - truly - and as such resulting suicide attempts are not the result of any rational thought, simply a means to an end for true sufferers of depression or manic-depression. Hats off to Marian Keyes for her unique glimpse into mental illness and her ability to convey that it is not a weakness of character but an ailment unto its own. Helen Walsh is no lightweight, she is a strong, confident woman. The story of the band, well, I wasn't really into it but the rest kept me going. I really like this narrator too. Very well narrated, this novel gives a chilling insight into depression, and how the Irish experienced their fall from grace. While the plot was a little light, the narrative and wit, and the downward spiral of the heroine more than made up for it and perhaps that is ok. I loved the ending, and it wasn't that predictable after all! We are reminded that happiness it not a permanent state even if you don't suffer from depression.